We do not limit ourselves exclusively to the integration with selected systems and we have a flexible approach to our customers’ needs. By default we analyze options of automatic integration with a specific system, both in terms of downloading information from our customer’s system to UNISONO Flow and the return export of the resultant data. If it is impossible to perform automatic integration, we are able to implement this process by file exchange (e.g. xml). We have developed our own integrating application PortalConnector, which enables to exchange data between UNISONO Flow and our customer’s system. It acts as a communication gate and is installed as a service of the Windows system. 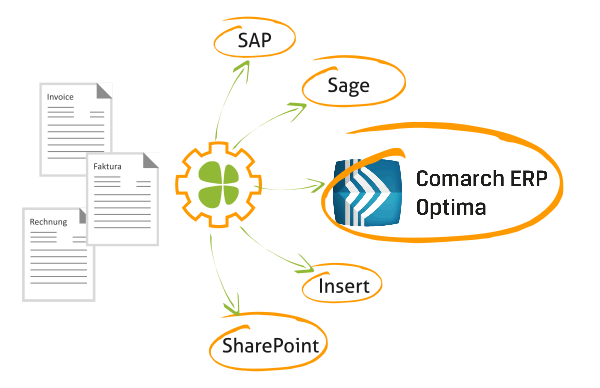 The application connects with selected financial and accounting / ERP systems of our customer, automatically or via files, allowing comprehensive data transfer.